Do you remember the smell of your grandmother’s chocolate chip cookies baking or the fragrance your spouse was wearing on your wedding day? How about the salty ocean air from the summers you spent at the beach? Smell is the sense most closely linked to memory. It helps us recall specific moments in time and is an . Without our sense of smell, it’s easier for our memories to fade. Your home is the background for so many special memories and when you intentionally create a signature scent, it helps cement those particular moments in your mind. But how do you know what your home’s signature scent is and how do you create it? Let me say, it’s easier than you think! Today I’m going to walk you through the 3-step process I used to discover the signature scent for my home so that you can find what works for you. Skip using cleaners with strong smells to avoid bringing in sterilizing scents. Use charcoal to neutralize strong airborne odors. Make sure children or pets can’t access it. Keep a bowl of white vinegar on the counter while cooking foods with strong smells to make sure odors are neutralized while cooking. Spray white vinegar onto carpets and rugs to easily neutralize any smells your furry friends bring into your home. This is an important part of determining a signature scent for your home because the naturally-occurring fragrances will play a role in the final aroma and you want to make sure they blend well. Once all strong odors have been neutralized, take a few moments to consider the smells your home naturally gives off. Does your leather furniture have a soothing, rustic smell? Do you have a collection of plants or flowers that have a fresh or floral scent? Now that you have an idea of the naturally-occurring aromas in your home, it’s time to think about the atmosphere you want to create. Think about if you’d like to use candles, diffusers, room or linen sprays. Think about the aesthetic in your home and go from there to determine a scent to match. 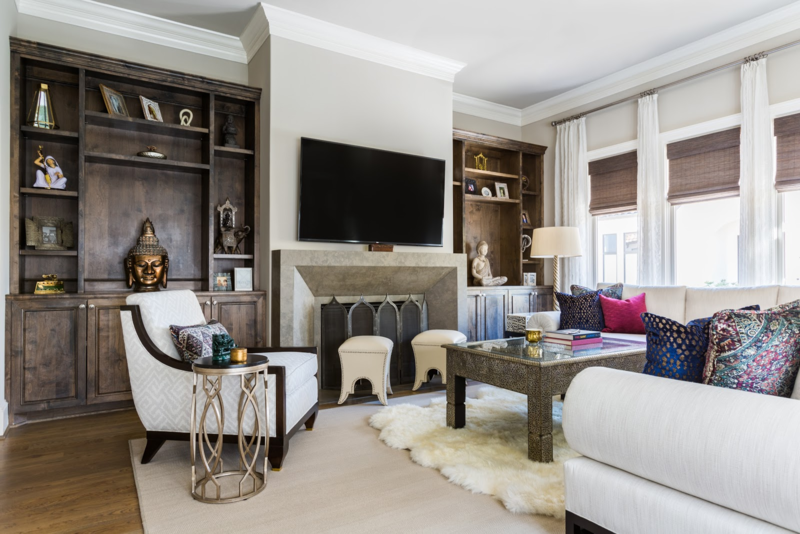 Rich scents like vanilla, smoked wood, and amber definitely match the design of this Moroccan-inspired living room. A scent laced with cinnamon or maple would also be a perfect compliment to a bold design. A crisp, clean scent goes hand-in-hand with the neutral color palette, comfortable seating and floor-to-ceiling windows of this living room that looks out onto the pool. Something with light floral notes or reminiscent of the ocean breeze would also work, as a nod to the beautiful outdoor view the room overlooks. 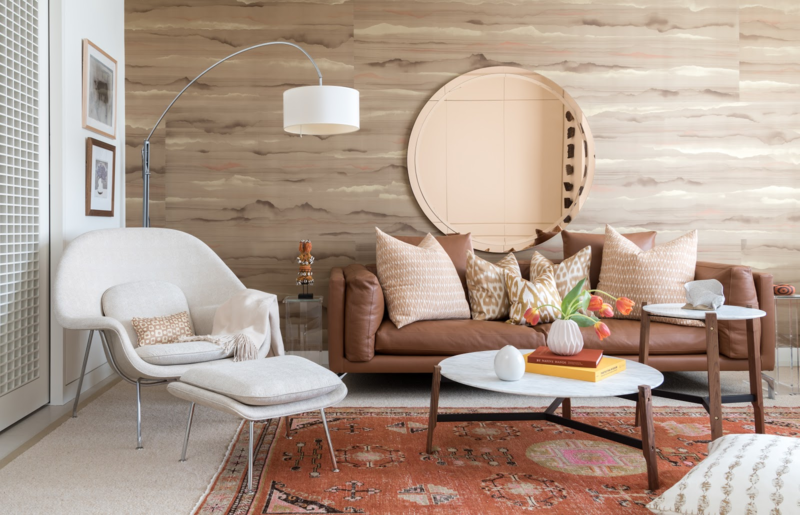 The touches of orange in the color palette of this living room might call for a fresh citrus scent. Or a light woodsy fragrance matches the natural and relaxed atmosphere and the brown tones of the sofa and accent wall. Like the design of your home, a signature scent is very personal. There’s no right or wrong fragrance. Just remember to neutralize the space before you try to determine any scents. Use the design style and atmosphere to think about what kind of smells you associate with that. As long as you love the scent, that’s all that matters! For more design inspiration and tips, be sure to and for a behind-the-scenes peek at our latest projects, .